When I wrote last month that my rate of blog posts might decline over the next few months I did not expect it would hit so hard so fast. The past few weeks are a textbook example of what happens when Real Life intervenes and firmly takes priority over our amateur radio activities. In this case a death in the family. On the plus side I was able to attend a meeting of Radiosport Manitoba (RSM). While they did not disclose all their contesting secrets to this outsider (though former VE4) it was a great opportunity to see some new and old faces. Unfortunately I didn't think to take a picture of these Manitoba contesters. Instead I'll mention who I met: Rob VE4GV (probably my oldest ham radio friend who I've known forever and an excellent contester), Dan VE4DRK, Leor VE4DXR, Cary VE4EA, Ed VE4EAR/VE4VT, Ed VE4YU and Adam VE4SN. Cary gave a brief talk of his family trip to Poland (SP) and his brief experience operating from there. This brought up the usual talk of how hard it is to work Europe from VE4 -- which I know myself all too well -- especially on the low band, and therefore why domestic contests like ARRL Sweepstakes are so popular there. Be sure to give them a call and say hello when you hear them in upcoming contests. Better still, visit them on June 9 when they will host Glenn W0GJ who will visit Winnipeg. He played a central role in the recent Navassa Island (K1N) DXpedition. He will likely talk about this however I understand the main topic is "Is 3 db worth a divorce?" That's a worthy subject and one I'd already been thinking about for this blog. In other news the CQWW CW 2014 results are out. As expected I took the #1 spot in the SOAB QRP class for North America. Unlike in SSB I had no chance to reign globally since there were some very attractive calls ahead of me. After all, would you rather strain to pull another weak VE3 signal out of the noise or, say, PZ5AV, GJ2A or 5H3EE? Even I was in there calling them, though sadly failed to work 5H3EE for the multiplier. 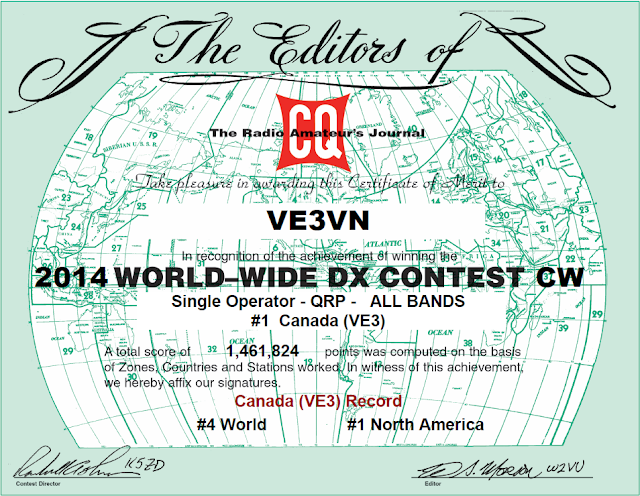 They have a natural advantage in CQWW, just as VE4 has in Sweepstakes. VE3 has an advantage in no contest. I am now back on the air and slowly getting back to this blog. Hopefully I`ll have a new post about antennas before too much longer.